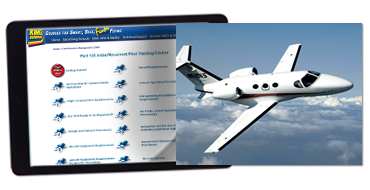 Get the most comprehensive and efficient initial ground training for your pilots. Whatever the size of your operation, this online course will give your pilots the training they need—with clear explanations of complex concepts. The KING Part 135 Initial Pilot Training course is a stand-alone course that fits into your Part 135 training package—and greatly reduces your workload by providing your pilots with a thorough review of the general knowledge topics required in FAR 135.345. Satisfies IS-BAO recurrent training requirements. When your pilots need annual refresher training they can use one of our two recurrency courses: Part 135 Recurrency A and Part 135 Recurrency B which may each be ordered separately and taken in any sequence. Upon completion of this course, they'll be ready for instruction in your company procedures and the aircraft they will fly. And because the course is delivered online, your pilots can take it wherever they may be—from any computer with a connection to the web. $647 $323 ... 50% off! Your pilots can take this self-paced course of study with clear, simple and fun learning independently, without tying up valuable company resources. Proficiency-based testing after each lesson is relevant and substantive, with emphasis on understanding for real-world application—not memorization. No trick questions or petty distinctions. Your Chief Pilot can keep tabs on each pilot's progress with our Course Completion Status Report. And when your pilots complete the course, they'll receive a course completion certificate and logbook endorsement. Let us take a big load off your preparation and classroom time. Keep your training pilot flying and not in the office or classroom. We cover the required general topics. All you have to do is teach the required aircraft and company-specific information. Your pilots will also receive downloadable Cockpit Reference Cards (choose On-Demand and/or Commuter Pilot) to remind them of critical flight and duty time limitations, takeoff and landing requirements, and IFR lost comm procedures. We will be glad to provide a syllabus and course key for your POI to review the training program. For a printable syllabus, click here. Call customer service at 800-854-1001 for more information. This is the best Initial/Recurrent solution for 135 Operators on the market. Great value! The course forms a nice "template" for maintainng knowledge in the 135 environment. Get it before any interview, and you should be "good to go." The content is all there it’s just a lot of reading. Previously, preparing for an initial or recurring Part 135 check, I would have to browse randomly through the FARs, hoping that I covered all the important and relevant sections. This course lays out all of the essential information in a logical ‘building block’ manner that makes it easy to understand and retain in memory. Well done to King Schools for this program! Fast and Efficient. Clear path to learning materials. Good Review..Only 1 misspelled word in the beginning.."acrobatics"..Should be "aerobatics"
Much more effective than other computer based training programs. John and Martha always put it together in a way that is clear to understand. I always get a lot from your courses. Thanks. You organized and presented the necessary information in an easy to use format. Being completely unknowledgeable of Part 135, this provided a thorough understanding of that which is expected of a new person to Part 135. Thank you for making a seemingly difficult task a smooth and easy process. I grew up with John and Martha. Passed every test except one with 100% (The other was a 98% I owe it all to King Schools. I recommend this training to every one of my students as well. Never a dissatisfied pilot as they always pass the first time. This was great, easy to understand training. I do miss seeing John and Martha and their clever (funny) way of presenting the material..